Merit might be a new vampire, but she is a high profile one. She is (was?) part of an important human family, and she is The Sentinel for her vampire house. She has responsibilities heaped on her shoulders despite the fact she hasn’t been at the whole undead thing for very long. Ethan Sullivan, her master and object of her lust, decides she can use her human family connections to further her vampire family connections. (Sounds confusing, but it isn’t!) The bonus of all this is that when Merit goes off to a function to connect with her dear old dad – Ethan tags along. Time they spend together is time well spent, if you ask me. They are as hot and chemistry-laden as ever – but alas, also as stubborn as ever. That combination makes them together a mixed bag of sexual tension and general hilariousness. I love their dynamic – even though they aren’t even “together.” Imagine the fireworks and heart palpitations that will arise when they ARE together (believe me, I have). Anyway…just saying. The books are worth reading for them alone. Luckily, they don’t run the whole circus. Merit’s best friend Mallory and her boyfriend Catcher are always up to add entertainment value to the stories…and of course, there is Morgan. Merit’s other love interest – even though she is doing it for political gain. He is a nice guy, and I feel sorry for him. Mostly I just feel sorry that I should like him more than I do but…nope. Sorry. He doesn’t do anything for me. Anyway – once again, this book has it all. Action, angst, humor and a fantastic supernatural world. Pick this series up, you won’t regret it! Seems a nice series, thanks for introducing it to me in your review! BTW don't miss my first spring giveaway! But it was the next book when I totally changed my mind!! This is one of my favorite series! 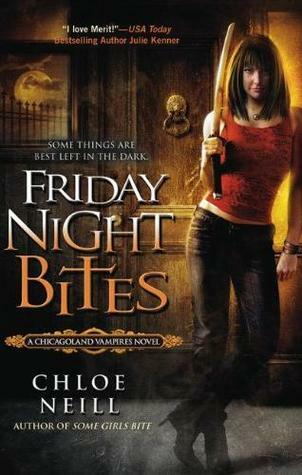 Chloe is an amazing writer! Can't wait to read Hard Bitten. I need to read this one. I really enjoyed Some Girls Bite, but I haven't even looked into getting the second one. It just kind of slid to the back of my mind, I guess.